43 year old Samuel Ellisor lies on the ground as he's tended to by EMS personnel. Ellisor crashed his truck into a tree after he reportedly set his own house on fire (Corporal Ramey Bass pictured at right investigated the accident). Man Allegedly Sets His Own House on Fire, Crashes Pickup, LIVINGSTON, May 6, 2014 - According to witnesses, at approximately 11:40 am on May 6, 2014, a man set his house on fire, jumped into his Ford F-150 truck, sped away taking out a neighbor's fence, then crashing into a large pine tree a short distance later. The man, Samuel Griffin Ellisor, 43, of Livingston reportedly has admitted to police that he did set his house on fire. Firemen from Livingston, South Polk County, Onalaska, and Scenic Loop arrived to find Ellisor's brick home located at 177 Mudd Road (near Providence Road off US-146) engulfed in flames. Firmen were battling the house fire, while other firemen were trying to stop brush fires (started from the house fire) from getting out of control. Ellisor's home burned to the ground. 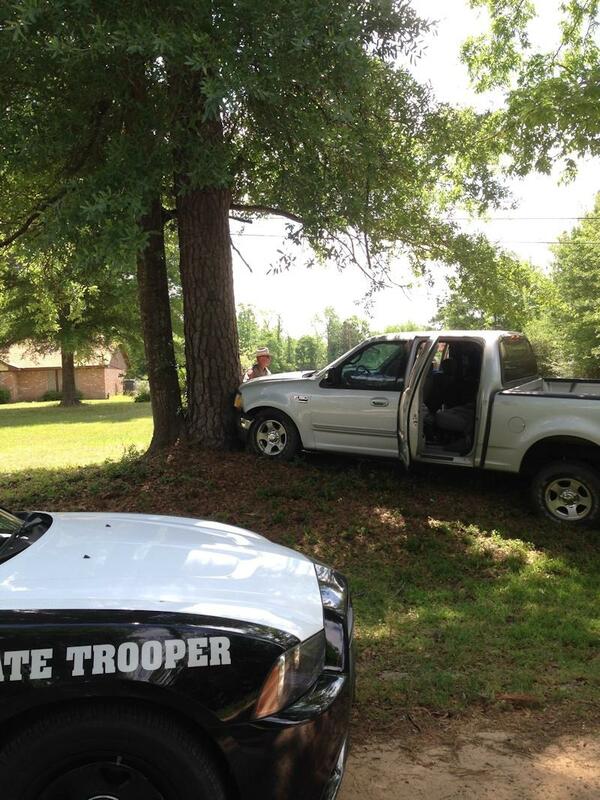 In the meantime, Ellisor, crashed his truck into a large pine tree off Galloway Road. Americare Ambulance Service was dispatched to the scene. Ellisor was transported to Livingston Memorial Hospital with undisclosed injuries. His pickup was recovered by Ken's Towing and will be stored at Bounds Autoplex in Livingston. The accident was investigated to Corporal Ramey Bass with the Texas Highway Patrol while the house fire was investigated by Corporal Terry White with the Polk County Sheriff's Office. It is not know to PolkCountyToday.com whether or not Ellisor had homeowner's insurance. The house fire investigation has been turned over to Polk County Fire Marshal, Shannon Barron. In 2009 Ellisor slammed his pickup into a tree off US-146. Firemen arrived to find Ellisor's home off Mudd road engulfed in flames. Coporal Terry White with the Polk County Sheriff's Office conducted a preliminary investigation into the fire. As Ellisor drove away, he took out a section of his neighbor's fence with his truck. A fire truck from Scenic Loop pulls onto Ellisor's property. Onalaska Mayor, Roy Newport (left in blue shirt) assists and Onalaska fire team in operations.